Adventures In Uglyworld: Uglyworld #224 - Stop, Thief! Uglyworld #224 - Stop, Thief!, originally uploaded by www.bazpics.com. Last night after dinner we came back to the hotel to use our complimentary drink that we received when we arrived on Sunday evening (the hotel bar is closed on Sundays). 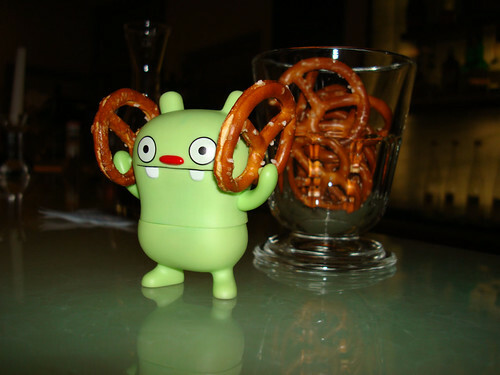 Jeero wanted to hang around downstairs with us too, and everything was going great until he noticed a couple at the other end of the bar had a glass of pretzels. He was over there as like a flash and after grabbing two of them he made a bee-line back in our direction as fast as his feet could carry him to shouts of "stop thief" from the couple. Thankfully after he explained that he didn't think he was "stealing" their pretzels, with his reason being that he planned to "give them a good home, in my belly" the couple laughed and forgot about the whole thing.